This is the one with the whales. That's right. The Romulans and Klingons are put aside for one episode in order to create an enemy from a faraway world, suggesting that humpback whales are not native to earth -- that they're an alien species that communicates with the whales of earth through some unknown method. When the space whales haven't heard from their earthbound pals (we're told they were driven to extinction centuries in the movie's past), they decide to pay a visit. The unintended consequence is the destruction of the power systems of everything in its path. Solution: The Enterprise crew takes a trip back through time (in the stolen Klingon bird-of-prey from Star Trek III) to the 1980s (conveniently coinciding with the production time fram of the film) in order to snag a couple of whales and repopulate the future. In the name of the franchise, the U.S.S. Enterprise boldly goes in search of fallen comrade Spock, who may have been reborn and regenerated on the "Genesis Planet." Those who have seen Star Trek II: The Wrath of Khan are familiar with the backstory. Brave Spock (Leonard Nimoy, who wanted to get out of the part) sacrificed himself to save his friends from radioactive destruction, with his sole justification being that "The needs of the many outweigh the needs of the few... or the one." As he died, his skin a mass of welts and burns, he gazed into Kirk's weeping face and gently confirmed that he was, and always shall be, his friend. The body was ceremoniously shot out into space and landed on the emerging planet. It was an operatic moment. Days later, the despondent Admiral Kirk (William Shatner) is still mourning the loss, and glumly presides over the ship as Starfleet performs their routine inspection. 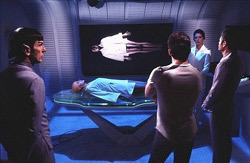 Meanwhile... our favorite cranky doctor, "Bones" McCoy (DeForest Kelley), is being driven mad by some force beyond his control -- somehow imagining that he is becoming Spock, or falling under the Vulcan influence. Though Star Trek: Nemesis is close on its heels, you will not find a worse Trek experience than Star Trek V: The Final Frontier. What makes it so bad? Could it be a scene with Spock in jet boots (no, those aren't ski boots! ), racing to save Captain Kirk as he plummets to his death from El Capitan. A now gray-haired Uhura, doing a dance in the sand with palm fronds against the moons of an alien planet (meant as a distraction, it certainly works). Or is it the atrocious effects, the product of a limited budget and too many miniatures?